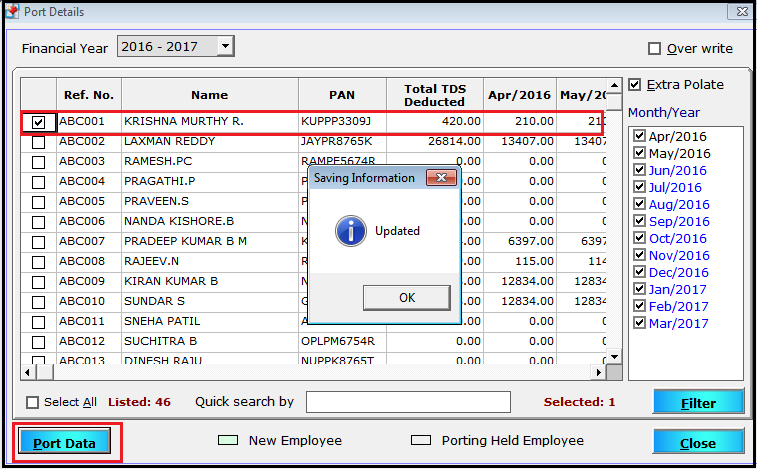 Hello, in this post we will show the process of One time tax for Leave Encashment in Saral PayPack software. One time tax is a process of calculating TDS on a lump sum amount given to the employee during the year. This is applicable to other than salary components such as Bonus, Ex-Gratia, Leave Encashment, Arrears, Additional Earnings, and deduction, etc. After enabling the option, enter the required salary settings, employee details, and salary calculations. Next, go to the Attendance menu and select Leave Encashment. 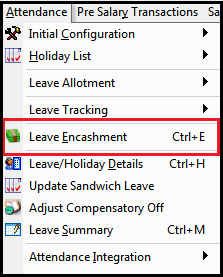 Here, do the required Leave Encashment calculation and save the details. For more information on working of Leave Encashment, view here. After the encashment process, select the record and click on TDS button. Here all the records selected will be listed. Select the records for with one-time tax has to be computed and click on Compute. A message will be shown stating that one time tax cannot be computed. This is due to non-porting of salary data for TDS computation. 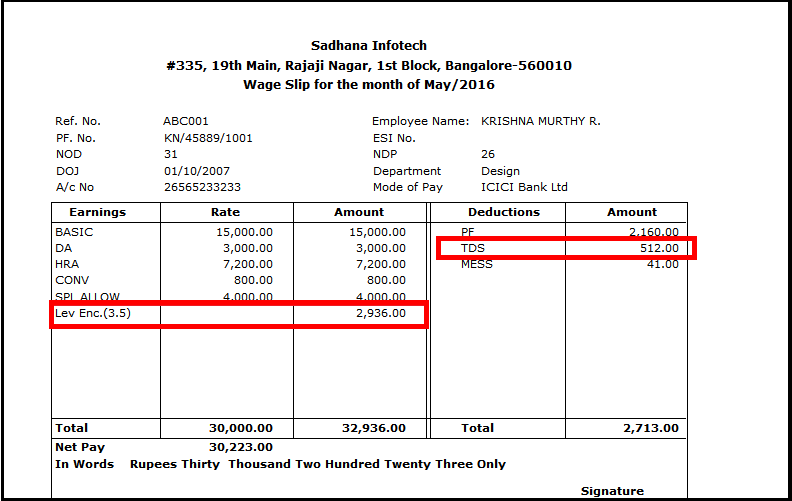 Hence, before doing one-time tax computation, the salary data has to be ported for TDS computation. 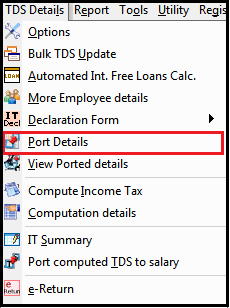 In order to port the details for TDS computation, go to Port Details under TDS Details menu. 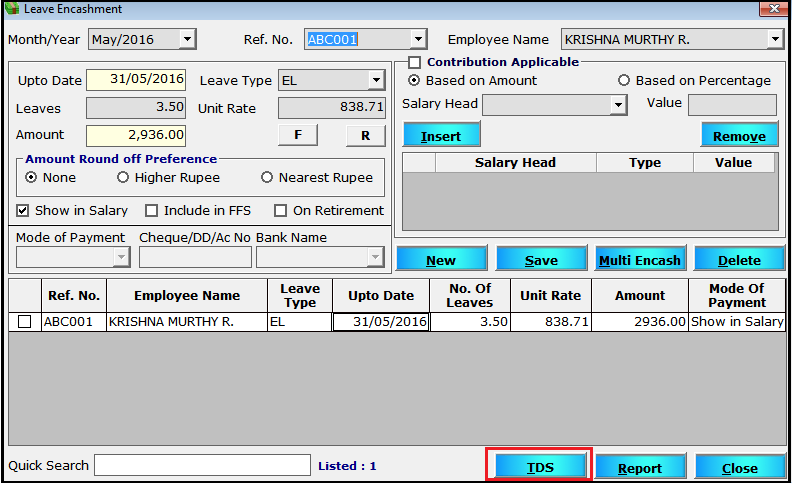 In this window, select the particular employee for whom salary details have to be ported and click on Port Data. Once the details are port, go back to Leave Encashment in Attendance menu. Here, click on TDS and select the employees for computation. After selecting the employees, you need to click on Compute. 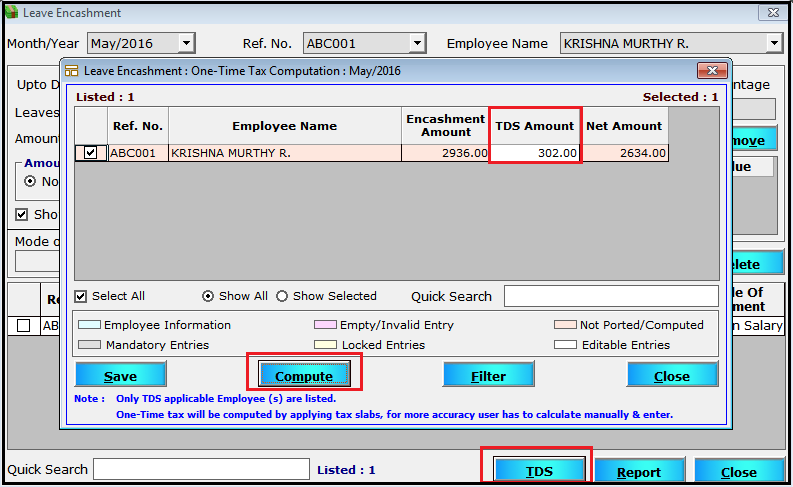 On click of computing, the one-time TDS is calculated and displayed against the particular employee. If required, you can edit the value. Else, click on Save to save the details. This tax will be combined with monthly tax and also will be considered for the deduction for the month. To see the tax deducted, go to payslip of the employee and then view the details. 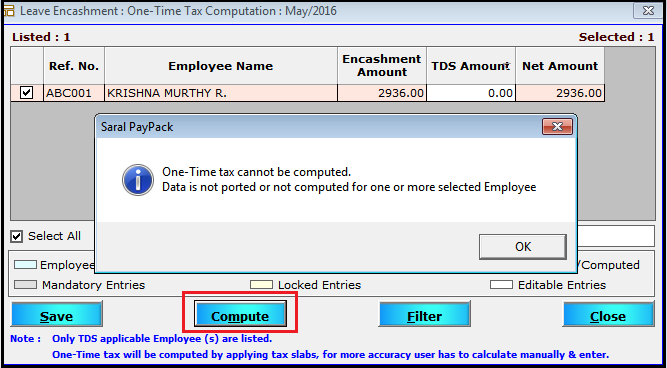 This completes the calculation of One Time Tax in Saral PayPack. Similarly, you can also calculate for other components. Let us know your opinion by commenting below.